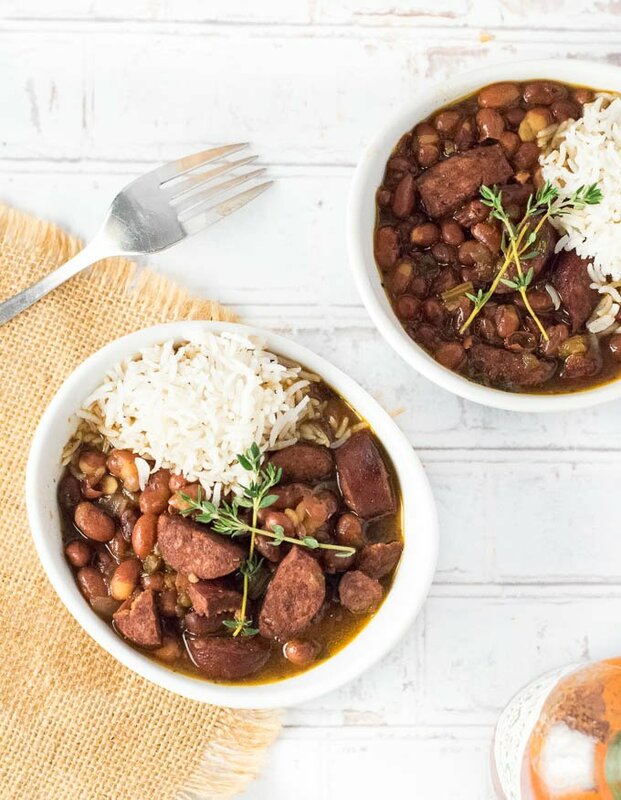 This Instant Pot Red Beans and Rice recipe is filled with perfectly tender beans, meaty bites of andouille sausage and all of the rich seasonings of New Orleans, but you won’t spend all day making it! Yesterday I ran a poll on my facebook page to see if you guys wanted to see more slow cooker or Instant Pot recipes. To no surprise slow cooker was the winner, however, I was impressed with how many of you want to see more Instant Pot recipes. 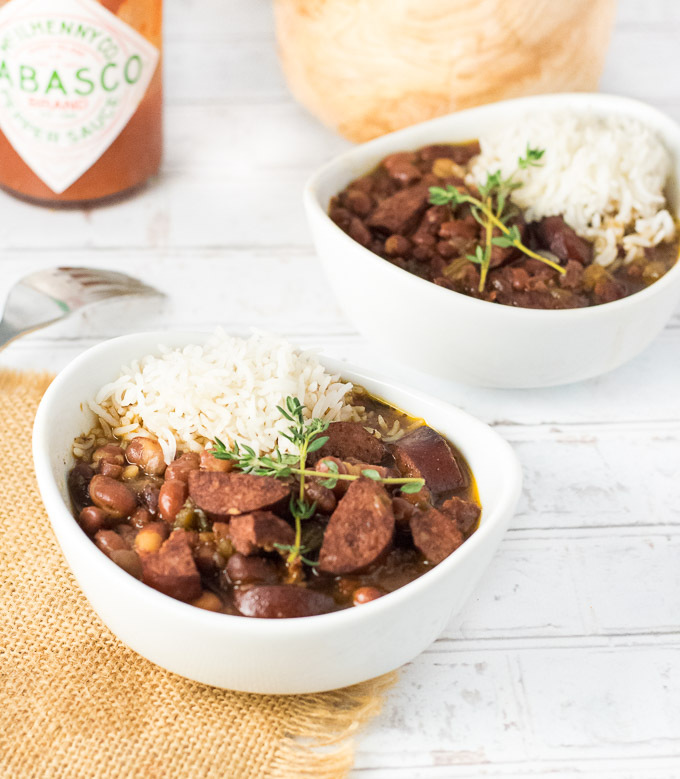 I will continue to publish both, but Instant Pot fans can take heart in knowing I will make sure recipes like these Instant Pot Red Beans and Rice make a regular appearance. Traditionally Red Beans and Rice was a popular Creole meal served on Mondays using leftover pork bones from Sunday’s dinner. This slow cooking meal could linger on the stove while the women went about their day. Today this boldly seasoned dish remains popular due to its rich meaty flavor and inexpensive ingredients. 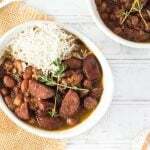 Rather than using ham, serving red beans and rice with sausage has become increasingly common. I’ve previously published a traditional Dutch Oven style recipe, which I humbly believe to be the best Red Beans and Rice recipe online. Do I Have to Soak Beans? No. Typically recipes call for soaking dry red beans overnight prior to cooking, however, this is not necessary. I never plan enough in advance to soak the beans in the refrigerator overnight prior to making red beans and rice. You can simply cook the beans in the Instant Pot a few minutes longer and they will turn out perfectly tender. Spoiler Alert: You need an Instant Pot (affiliate link) for this recipe. The Instant Pot turns this all day cooking session into less than an hour. There a few problems with a lot of the Instant Pot Red Beans and Rice recipes online that I hope to help you avoid. First of all, any recipe that tells you to throw in the vegetables and sausage right away with the beans is helping you make baby food. Seriously, I tried it. Your vegetables will be limp mush, and your sausage takes on the texture of a toasted marshmallow. Not good. Instead, I highly recommend cooking the red beans first and then add the remaining ingredients when the beans are almost finished cooking. Your final dish will have much better texture. Finally, it is important to get the cooking time right. Many of the recipes online had readers complaining the beans were not cooked all the way. Those recipe’s cooking times were simply too short. Soaking your beans will allow you to shorten the cooking time slightly, however, you can avoid pre-soaking the beans by cooking them in the Instant Pot for 40 minutes on high pressure, then an additional 10 minutes when you add the remaining ingredients. 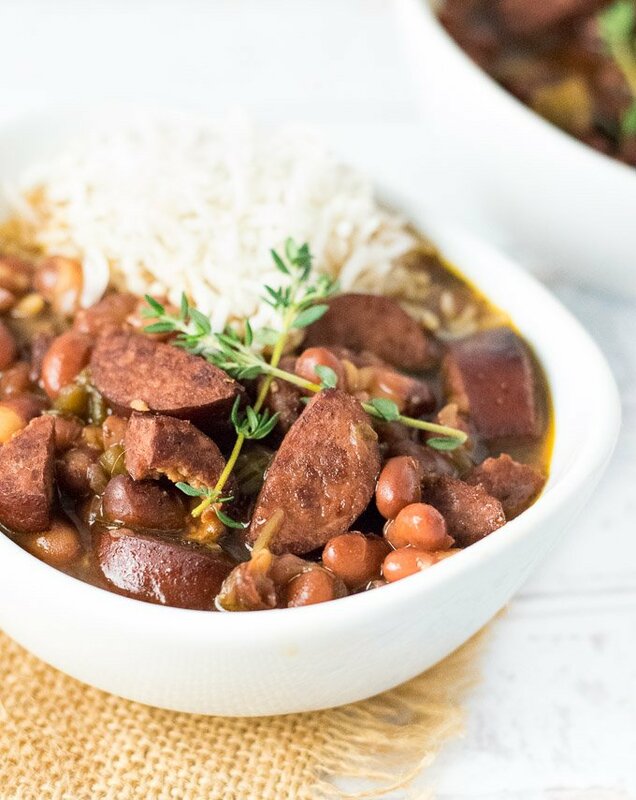 This Instant Pot Red Beans and Rice recipe is filled with perfectly tender beans, meaty bites of andouille sausage and all of the rich seasonings of New Orleans, but you won't spend all day making it! Set Instant Pot to Saute and prep ingredients. Add cooking oil to Instant Pot and heat until shimmering, then add onion, celery, pepper and salt and pepper. Saute until vegetables begin to brown, add garlic and cook until fragrant. Then remove all vegetables and set aside. Add sausage to the Instant Pot and saute until browned on all sides. Then remove and set aside. Deglaze the Instant Pot with a small amount of Chicken Stock (~1 cup) and scrape the bottom of the pot until free of burn on debris. Cancel the saute. Add remaining chicken stock, hot sauce, Worcestershire, beans, herbs and seasonings and set Pressure Cook for 40 minutes on high pressure. After 40 minutes, cover Instant Pot with a towel to contain any liquid and turn the release knob to Venting. After pressure is released, open the lid and add vegetables and sausage back into the pot. Cover the Instant Pot and set Pressure Cook for 10 minutes on high pressure. When done cooking, let it naturally release for 20 minutes, then remove the lid, and mash some of the beans to thicken the liquid slightly (the most you mash, the thicker it will be). Serve with a scoop of rice. Prepare the rice on the stovetop while Instant Pot is releasing pressure. Rinse rice under water and add to a saucepan with water and salt. Cover pan and bring the water to a boil. Set heat to low and simmer until water is absorbed by the rice. Refer to package instructions for exact cooking time. IF YOU LIKED THIS RECIPE check out my Instant Pot BBQ Pulled Pork recipe! If you enjoyed reading my Instant Pot Red Beans and Rice recipe then you should probably like me on Facebook and follow me on Pinterest too. That’s what I would do at least, because if you don’t get to know me but you still use my recipe it is kind of like taking candy from a stranger, and your mom taught you not to do that. Don’t disobey your mom, subscribe to Fox Valley Foodie today. This really saved a lot of time!